I’m a fan of Abelo poly National hives. They’re reasonably robust, well-insulating, correctly dimensioned 1 and pre-painted. I’ve been using these boxes for well over a year now and will review them shortly. The review will be generally positive. ‘Generally’ as I really don’t like the floors. They are by far the weakest part of the hive design and have a number of, er, flaws making them poorly suited to my beekeeping 2. Rather than ‘taint’ a future review with negative comments on these flaws floors I’ll deal with them in this post and ignore them in the future 3. 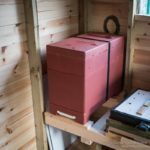 The poly hive retails at about £125 for a hive with 2 supers. The Abelo floor alone costs £25. At its most basic the floor serves as something to stand a compatible brood box on. It allows the bees to enter and exit and it often has features that discourage the entry of other animals … like mice. These days open mesh floors (OMF) are commonplace, allowing mites dislodged by grooming or miticides to fall out and away from the colony. How does the Abelo poly National floor 4 meet these requirements? 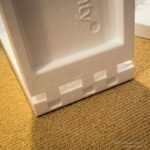 The Abelo floors are sturdy, ready-painted and nicely cast (molded? moulded? formed?) from dense poly. The paint (all mine are green or yellow though they may do blue as well) is tightly bonded to the poly surface and doesn’t easily wear away. I think the white patches in the picture below were there from manufacture, not from use. The floors have an reasonable area of mesh, securely held in place. The mesh area isn’t as great as some wooden floors, but is at least as good as my homemade kewl floors. 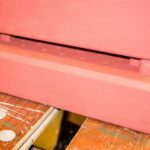 On either side of the floor, on the underside, there is a recessed handhold that really helps in lifting hives. These recesses are also convenient anchoring points for an elasticated bungy to hold the roof in place 5. Probably the best feature of these floors is that they’re fully compatible with other National hive components. 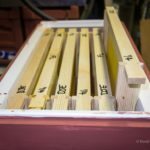 I’ve mixed them with cedar or Swienty poly brood boxes and they fit perfectly. The interface between the boxes is flat, the correct dimensions and pretty hard-wearing. Abelo do tend to design rather ‘fiddly’ equipment and they’re very keen on ventilation. They usually include these fiddly design features to allow increased ventilation – or at least the option for it. The entrance block is in two parts (see photo above). A grey plastic reversible full-width block that drops into two vertical slots on either side of the landing board. One way up the entrance is reduced to ~8cm wide. Inverted and the entrance is sealed. There are four vertical ventilation holes that remain open on either side of the entrance block. Are these really needed? After all, the ventilation provided by the OMF far exceeds the little bit extra through the entrance block. There’s a second green 6 plastic slider that can be added to the entrance block to provide an integral mouse guard. Or – more options – if inverted it can be used to further reduce the entrance to one bee width (or closed off altogether). Returning to the underside of the floor, the weakest part of the design is the Varroa tray. The tray is unpainted polystyrene, square with a shallow lip. It slots into a recess in the underside of the floor, supported by two metal runners. The area of the tray is approximately 75% of the floor area of a National brood box. With a full colony, some of the Varroa will fall outwith this area. This isn’t a major issue, but it could lead to underestimating the mite load in the colony. The tray slides in and out easily, facilitated by a small protruding handle on the underside. Unfortunately, there are some large gaps around the tray when it’s in place. 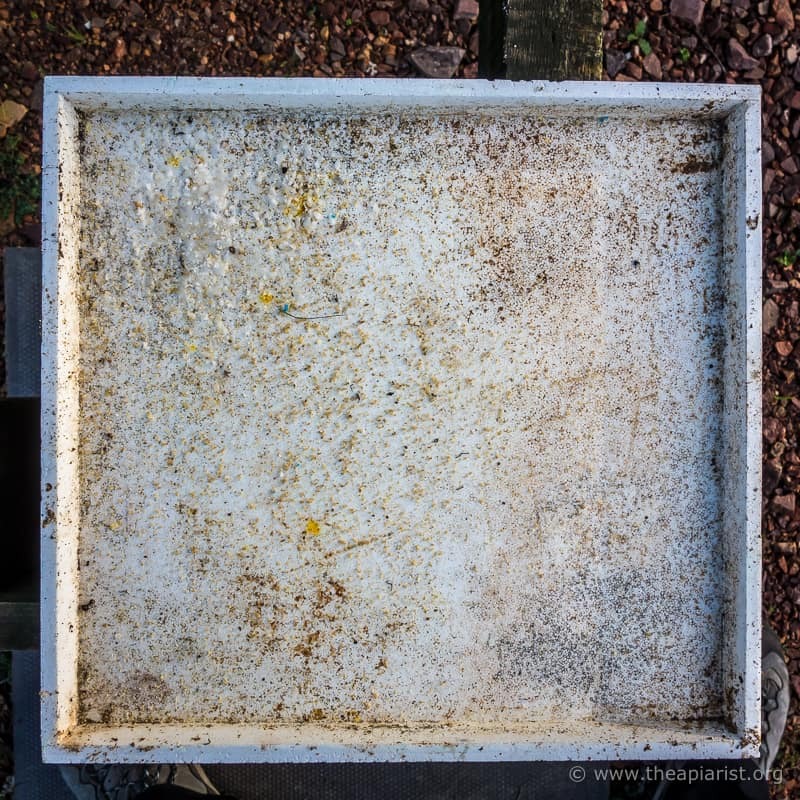 If you sublimate oxalic acid a significant proportion of the vapour escapes around the edges of the Varroa tray. The gaps around the tray are awkwardly shaped, so it’s not straightforward to plug them … other than with foam blocks perhaps. 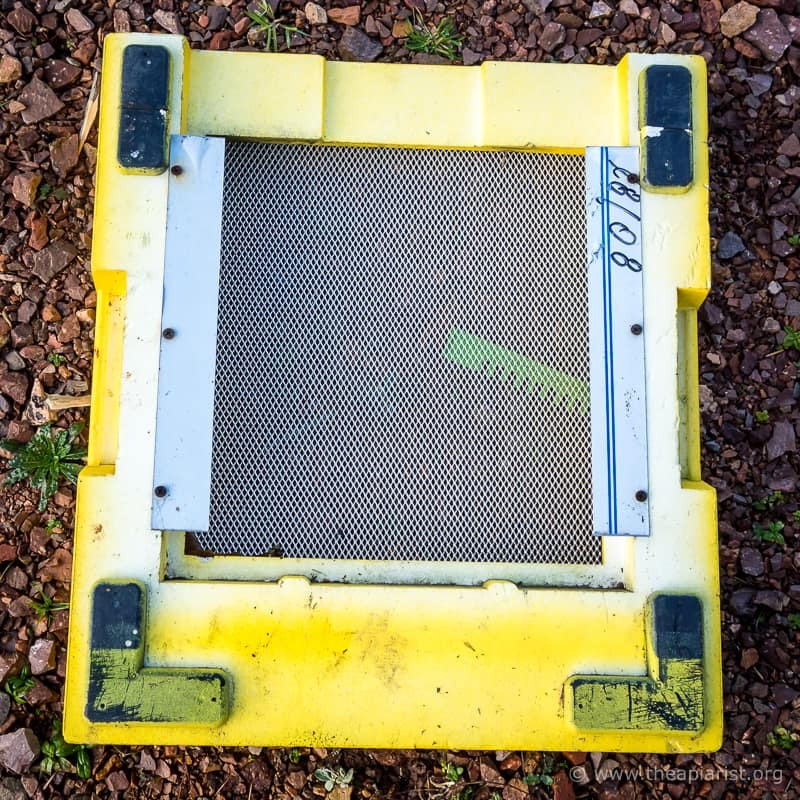 It’s also not possible to easily temporarily replace the tray with a Correx sheet. If you did it would need holding in place so potentially putting you too close to the hive and clouds of escaping oxalic acid vapour. Resourceful beekeepers will work out solutions to these problems, but it would have been better if the defects weren’t designed into the floor in the first place. And, before you ask, inverting the tray does not significantly seal off the gaps! It is possible to make reasonably ‘vapour-tight’ poly Varroa trays. For example, the Thorne’s Everynuc has one that slots neatly in place. I’ve used these dozens of times and there is very little loss of vapour in my experience. However, the Abelo floor (and the Everynuc Varroa tray) has the additional problem of being unpainted polystyrene. These very quickly become stained, with pollen, bee faeces and all of the usual rubbish that falls through the floor. This staining makes counting Varroa much more difficult. Alternatively, you could source some white Correx sheet to make an insert that would be easy to draw a grid on, count Varroa in and clean. And, inevitably, easy to lose. In summary, the problems with these Abelo floors are three-fold. 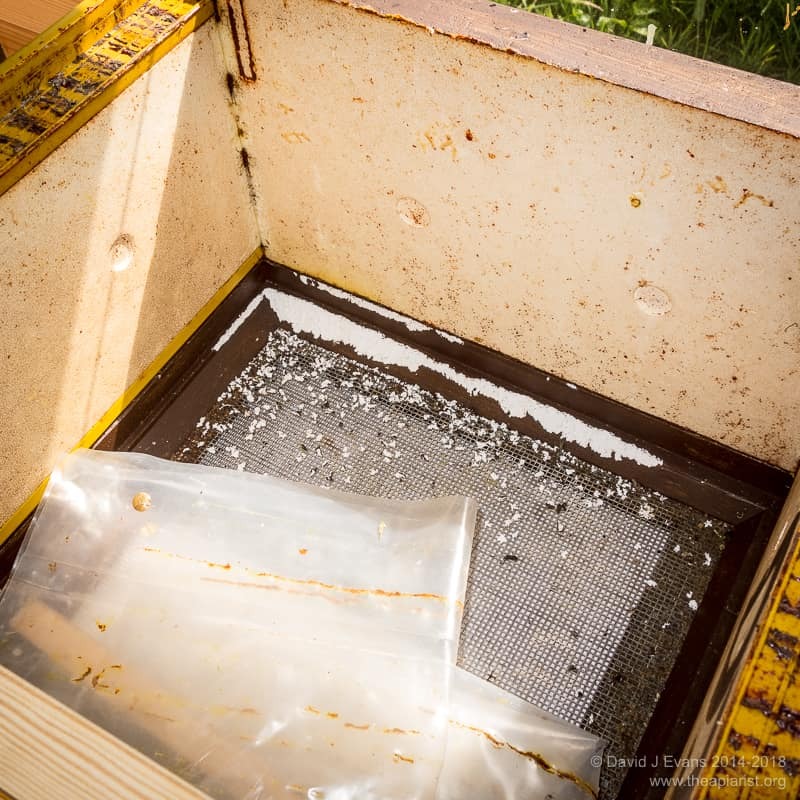 Intentionally (the entrance block) and unintentionally (the Varroa tray) leave too much ventilation to conveniently be used when sublimating oxalic acid. The success of these depends upon retaining the vapour within the hive while it condenses on internal surfaces. Allowing it to leak out excessively simply makes the treatment less effective. 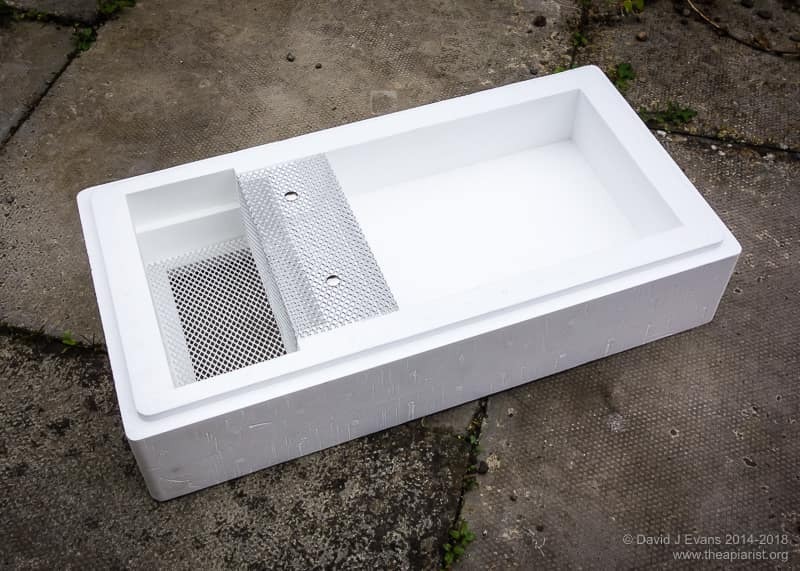 Even if you don’t control Varroa by oxalic acid vaporisation the Varroa tray gets dirty quickly and is difficult to clean. Finally, it’s not possible to securely fix the entrance for transporting colonies, other than by using loads of gaffer tape. Even if you do, the large landing board on these floors makes strapping hives together awkward. Most of my hives have homemade kewl floors. These probably cost about £6 each to make and have none of the problems listed above. They offer additional benefits as the L-shaped entrance ‘tunnel’ prevents mice from entering the hive and reduces robbing by wasps. 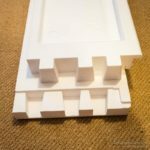 These DIY floors have a simple, easy to clean, Correx Varroa tray that is much more ‘gas-tight’ than the Abelo design. 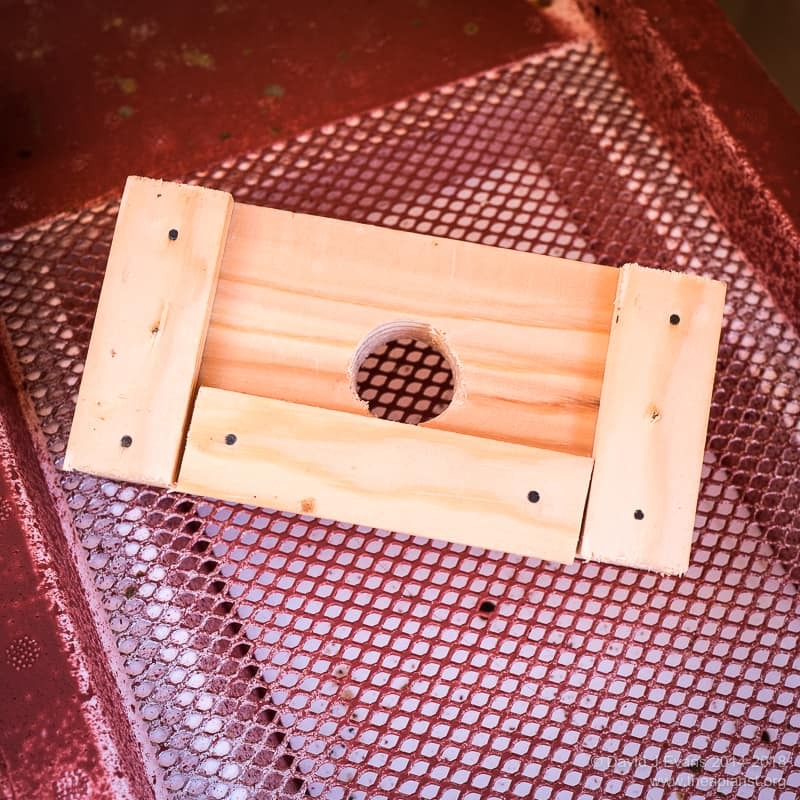 An L-shaped wooden entrance block can be screwed in place for transport and the landing board is effectively integral to the floor, replaceable if damaged and does not project in a way that inhibits strapping hives together for transport. Kewl floors are unsuited to being used in the bee shed. For these hives we use slightly modified cedar floors made by Peter Little of Exmoor Bees and Beehives. 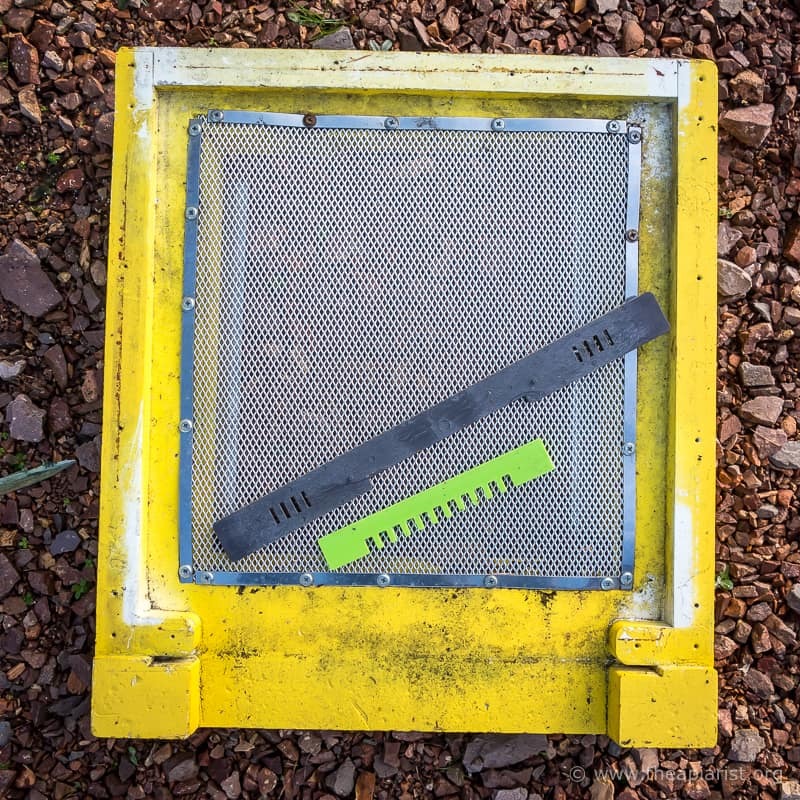 These have a ply removable Varroa monitoring tray that provides an excellent ‘gas-tight’ fit when sublimating. These floors are not inexpensive, but they are very well made. Considering the quality of the rest of the Abelo National hives, these floors are a disappointment. I use them if I’ve run out of everything else and I kick myself when I discover – as I did a few weeks ago – that there are still some in use when the midwinter mite treatment is needed. Floor and flaw are homonyms, two words that sound the same but have different meanings. Floor, meaning in this context the ‘base of any cavity’ probably dates back to Old English (Anglo Saxon) ~317AD. Flaw in comparison is a young upstart, with the first recorded use being by Robert Hooke in 1665. 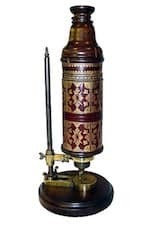 Hooke was, amongst other things a microbiologist, and he used the word flaw in his book, Micrographia, which is about his observations using a microscope (and telescopes). Hooke was the first to use the word ‘cell’ following microscopic examination of plant cells, which have walls, because the appearance reminded him of honeycomb. 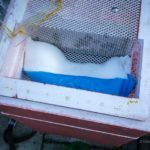 This entry was posted in Beekeeping, Floors, Hives and nucs and tagged Abelo, Robert Hooke on January 25, 2019 by David. 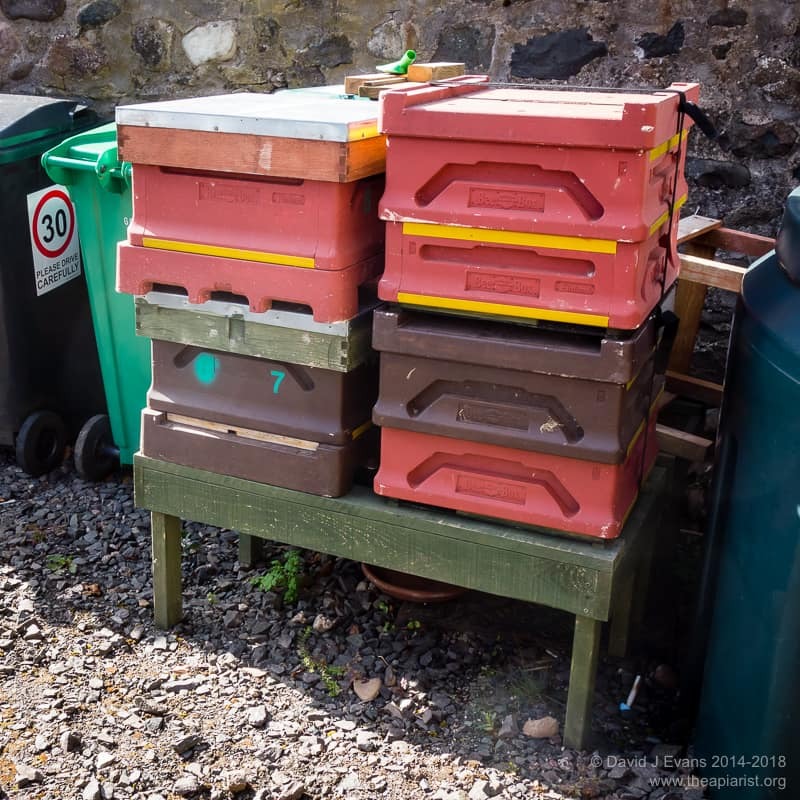 The humble hive stand … so often ignored, overlooked or taken for granted. 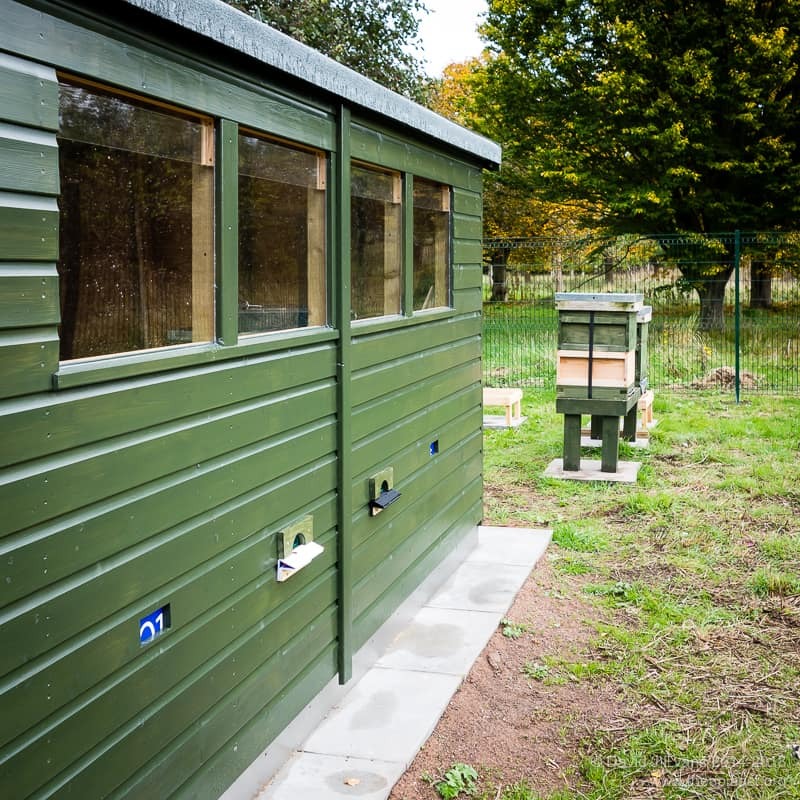 Hive stands fulfil an important function in the apiary. If designed properly they help both the beekeeper and the beekeeping. 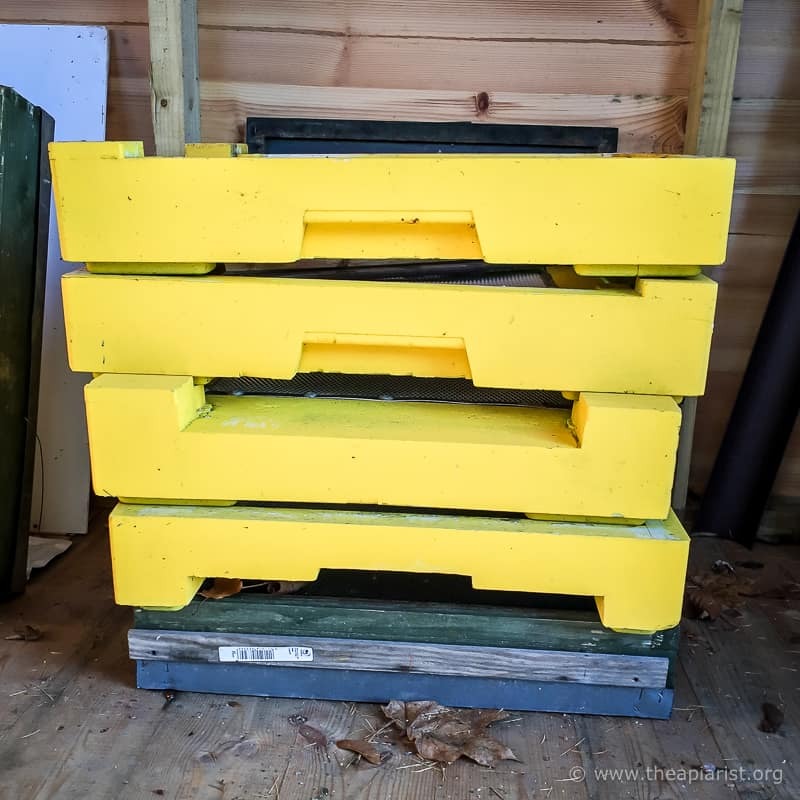 In contrast, the bees themselves probably gain relatively little, though there are some benefits for the bees from using well-designed or constructed hive stands. Do the bees care about any of these things? Why not? Well, we could get into a philosophical discussion here about sentience in honey bees and whether they ‘care’ about anything. However, it’s probably easier to simply state that none of these things make any real difference to the bees within the hive. They’re perfectly happy on the ground or, as below, on a pallet. There are thousands of bee hives sitting on pallets across the country. Bee farmers routinely use pallets, often with four hives in a square, each facing in different directions. 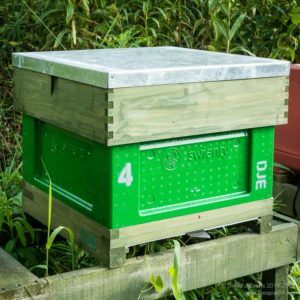 The pallet provides a relatively flat platform 1, it prevents weeds growing directly across the hive entrance and it is reasonably stable. 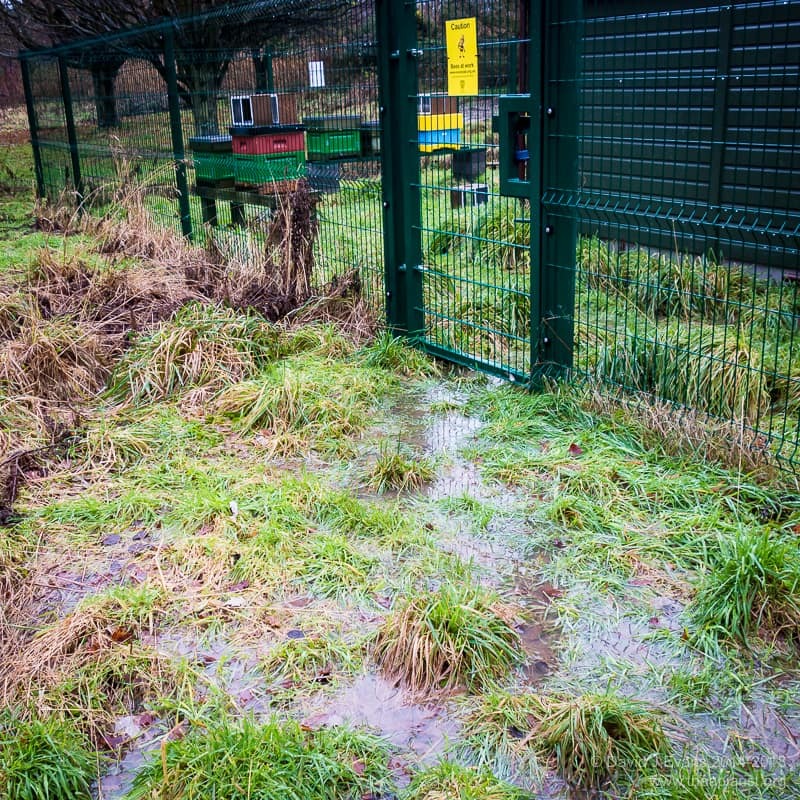 It’s a perfectly adequate solution … unless your apiary is prone to flooding. Where did Noah keep his bees? In his Ark hive. Many beekeepers develop bad backs. Hive inspections involve lots of lifting – hopefully of heavy supers – and bending over. Although you can inspect colonies on pallets from a kneeling position it’s not something I enjoy 2. Therefore, if I’m going to be standing, it helps if the hives are closer to me than they’d be on a pallet. Almost all of my hives are on hive stands of some sort or another. 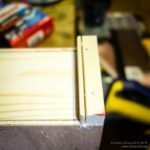 If you are building (perhaps too grand a word for most of the stands I use … cobbling together?) hive stands there are a few design decisions to be made. One or more hives per stand? Single stands are fine, though they perhaps lack flexibility. They do little other than separating the hive from the ground. Most of the equipment suppliers sell them, some with inbuilt landing boards which is a nice touch, though unnecessary. I’ve got a handful of these but they tend to get used for bait hives or as a last resort. Firstly, they’re a bit too low for me, only lifting the hive about 25cm above the ground. Secondly, they provide no ‘work area’ around the hive. The advantage of a single hive stand is that the colony inspection cannot disturb any other colonies on the same stand. There’s nothing else on the stand to get jarred, bumped or disturbed. 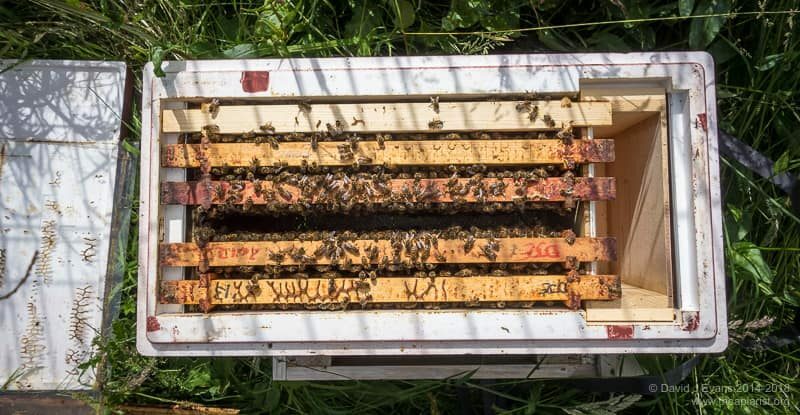 However, with care during inspections and calm bees, the benefits of a double (or more) hive stand outweigh the risk of disturbing a second colony. I therefore prefer double or treble hive stands. Many of my hives are on double stands (on the right in the image below). This was an entirely pragmatic design decision as I’d managed to scrounge a pile of pressure-treated 1 metre pieces of wood from an unfinished fencing project. I cut one fence panel in half to make the end pieces, with four others to make the sides and support rails. With four 3×2″ legs from pressure-treated decking joists (also scrounged) and a handful of screws these cost almost nothing and have worked very well. Ironically, they’re ideal for one hive … this leaves space for the various colony manipulations. Inevitably, most have two hives on them 🙁 Or three poly nucs. These double stands are easy to move about. They fit in the back of my small car. However, once you start making treble hive stands things get a bit heavy. 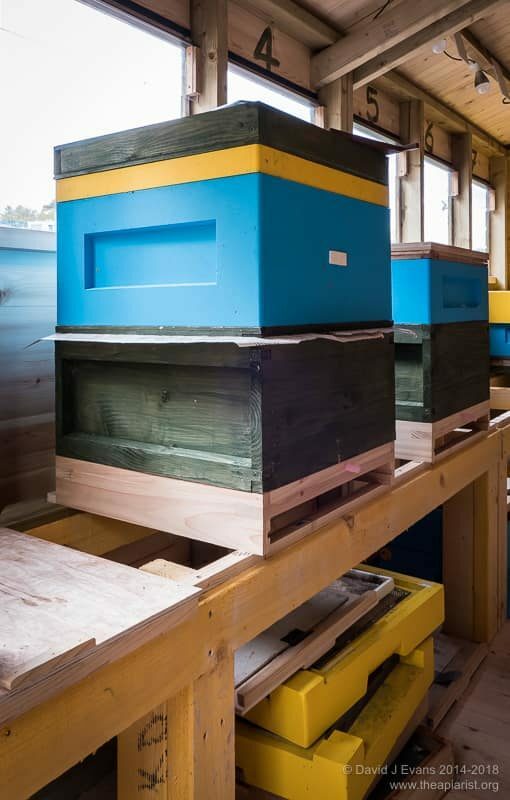 If they’re built strongly enough to take three full hives (perhaps 250+ kg at the height of the season) they might also need intermediate legs for support 3. 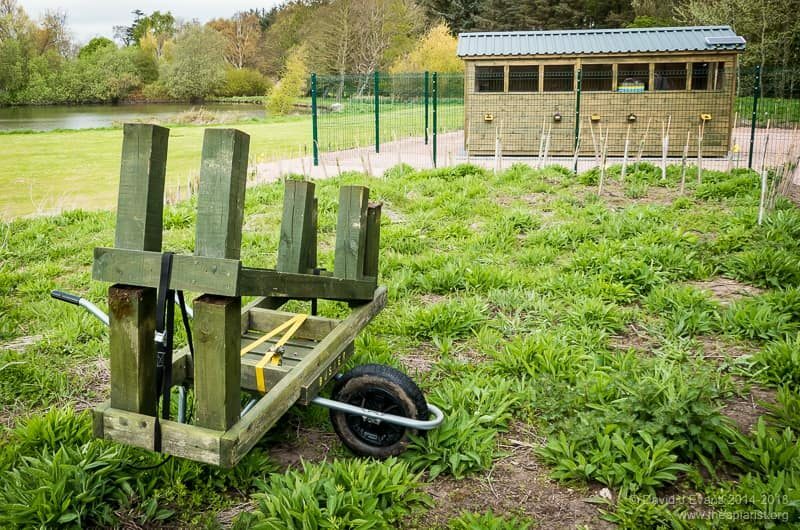 As an alternative you can assemble hive stands on site from breeze blocks and horizontal bars. Again, a fencing project came to my rescue and I managed to get several 2.5m metal uprights that are immensely strong and make excellent rails to stand the hives on. These are very effective as hive stands. Inexpensive, strong, big/wide and ‘bombproof’. Wooden rails are fine as well, but need to be substantial for multiple hives. The height of a hive stand is a personal choice. What fits me – standing 6’1″ in my wellies and beesuit – is probably too high for a slightly built beekeeper a foot shorter. I like the top bars to be about the same height as a roof stood on its edge i.e. ~17-20 inches. This is because that’s often exactly where the roof ends up … leaning against the hive stand. 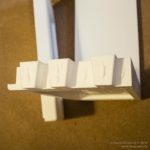 Three 140mm breeze blocks place the top rails of the stand just under 17″ from the ground, which is close enough for me. Depth i.e. front to back distance, of the top of the stand should (obviously) be the depth of the hive. Any more and it can cause problems with the sublimators that need to be inverted during use. However, what’s more important is the separation of the horizontal rails that support the hive. This is an ideal place to hang frames temporarily while you conduct inspections. Very low hive stands and very deep frames don’t mix well. The steel fencing post and breeze blocks hive stands (above) have too narrow a gap for hanging frames. It can be done – and regularly is done – but they have to be placed at an acute angle. In our bee shed the hive stands are higher than usual as we spend a lot of time with the hives open and this saves bending down too much. The colonies also get far fewer supers, so rarely get unmanageably tall. The space immediately below the hive stands is used for storage, but there’s still sufficient space between the hives to hang frames on the horizontal rails that are 15 inches apart. 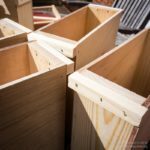 There are dozens of hive stand designs available, some simple – like those above – and some much more complicated. There are clever stands with folding legs that make transportation easier. I’ve not used these so can’t comment. 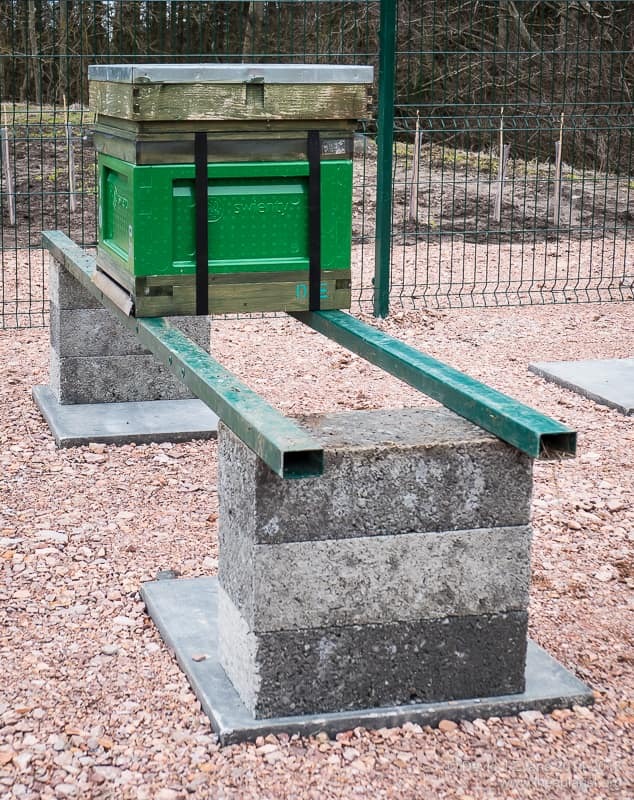 Apiaries very rarely have level ground … the paving slabs in the photos above are properly levelled, but very much the exception. However, hives generally need to be reasonably level. If you’re using foundationless frames they must be almost perfectly level perpendicular to the orientation of the top bar or the comb will be drawn at an angle to the top bar. 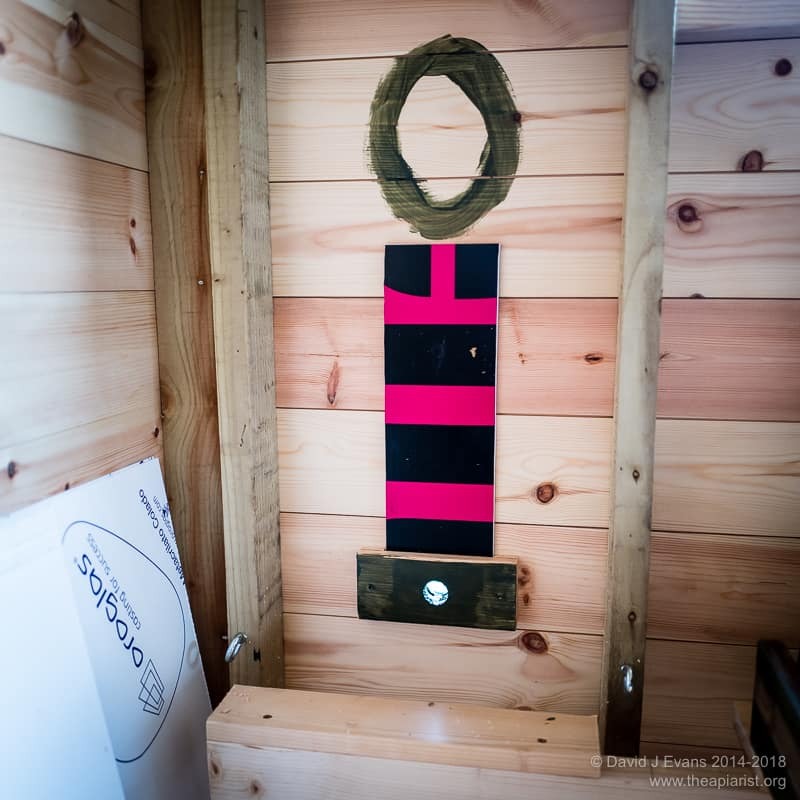 Very few stand designs provide an easy way to level the hives … but here’s one that does. Calum, a regular contributor of comments on this site, sent me this photo some time ago. This hive stand is built using adjustable galvanised steel scaffolding feet as ‘legs’. This is a neat solution. It probably needs some additional cross-bracing but is easy to dismantle and transport, and easy to level. The only thing stopping me from trying some like this is the cost of the base plates and screw jacks. These are widely available and on eBay are £35-45 for four. Lyson make something similar but, because it’s specifically for beekeeping, it costs $80 4. If you know of a less expensive source please add a comment below. Finally, I like my stands to have crossbars i.e. going from front to back between the rails. You can see some in the photo of the two hive stands on the hivebarrow. Most of my double stands are similarly set up. 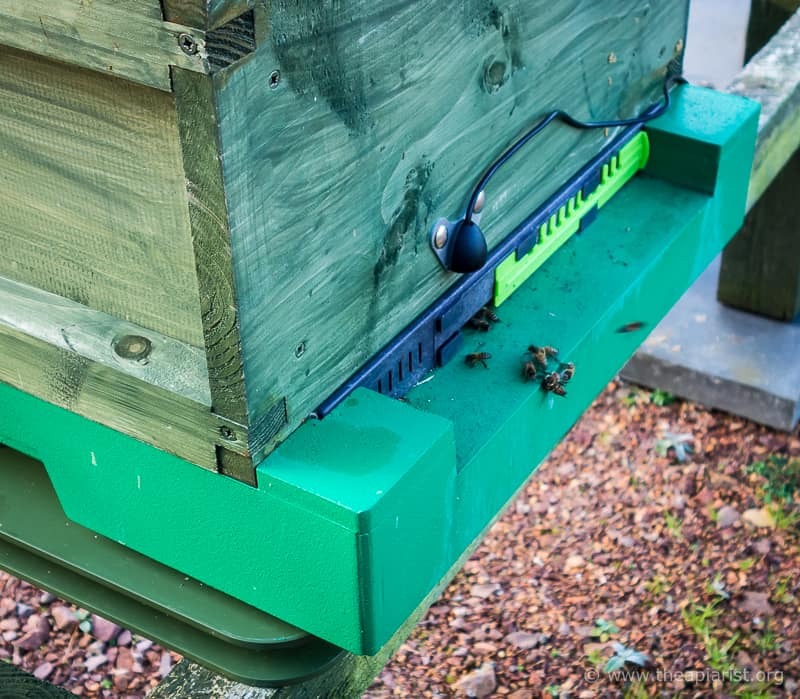 These crossbars provide a convenient secure point to put a strap around, effectively tying the hive to the stand. For poly nucs in particular this is essential if your apiary is exposed and windy. 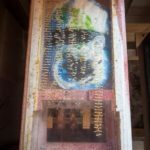 This entry was posted in Beekeeping, DIY, Equipment, Hives and nucs and tagged backache on October 19, 2018 by David. How about this for an apiary in a truly stunning location? 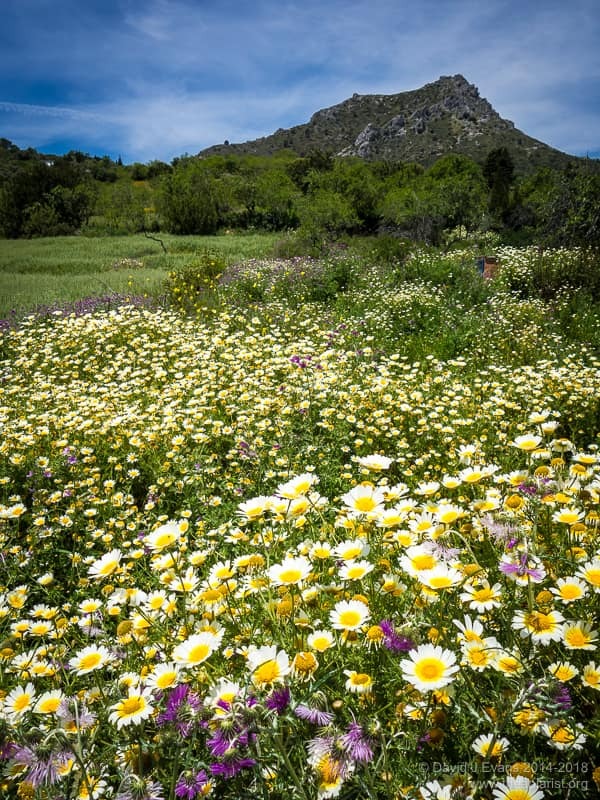 I discovered this apiary while out walking in the Andalucian hills in Southern Spain in mid-May. 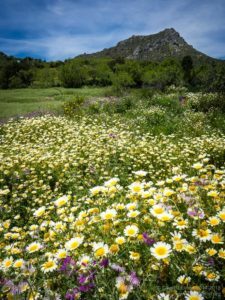 It was at the end of a forest track, miles from anywhere, with breathtaking views over the cork oak woods South towards the Strait of Gibraltar. It was a bit hazy that afternoon, but on a good day you can clearly see across the Strait to the Rif mountains in Morocco (~100 miles distant), with the faintest trace of the Middle Atlas beyond them. The photo doesn’t really do justice to the location of the apiary. Yes, the view was great, but what was at least as impressive was the amount of wildflowers around. It’s not an arable area. Most of the farmland was olive trees or lemons, with large areas of wildflower meadow and mixed deciduous woodland. Much of this was cork oak, but it was interspersed with Corsican pines and a variety of other things I couldn’t name. I’d be surprised if any of it ever sees a spray of any kind, and the only grazing is by horses, a few feral goats and the elusive wild boar 1. The scene on the right is typical and the road verges were the same, with acres and acres of these beautiful “weeds” everywhere. Unsurprisingly, the other thing missing from these pictures is the noise. Everywhere I walked – even on days when I barely left the fringes of the village – I was accompanied by the incessant drone of insects. There were bees everywhere and – again unsurprisingly – the local mixed floral honey was fantastic. From a beekeeping point of view it really did seem idyllic. Perhaps the only issue would be the temperature. 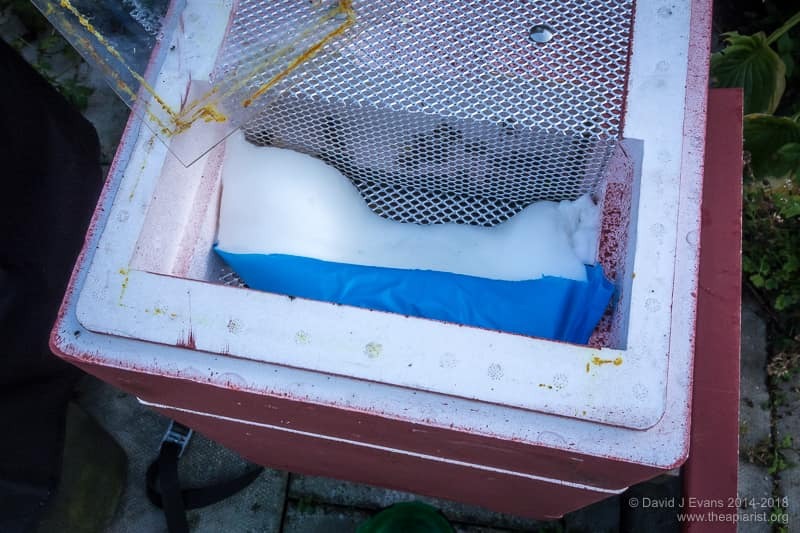 In Spring the midday temperatures were in the mid-20’s (°C) and – going by my experience of working colonies in the bee shed – that can get pretty hot and tiring in a bee suit. 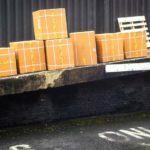 There were about 20 hives in the apiary, lined up on pallets all in full sun. Unlike other apiaries in the area there was no registration number displayed, so it might have been a temporary site from which the hives would be moved in high summer. To a beekeeper familiar with the stackable boxes of a National or Langstroth, the hives were unusual. The majority were single boxes, with hinged lids and one or two entrances low down at the front. These are Layens hives, a single large, deep box containing 15 or more frames. Each frame is about the same width as a British National brood frame, but is almost twice as deep. Georges de Layens, who invented the hive in the 19th Century, designed it for minimal management beekeeping. 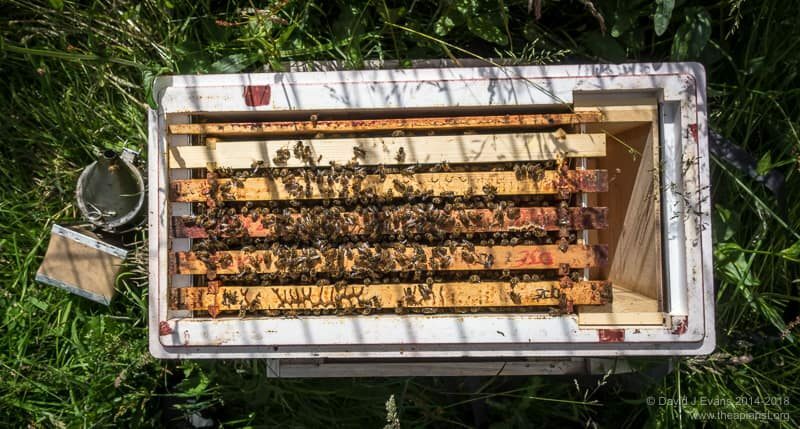 No weekly inspections, no overt swarm control, simply give the bees sufficient room in a well-insulated hive and return to harvest the honey at the end of the season. Well, it certainly could be that simple. 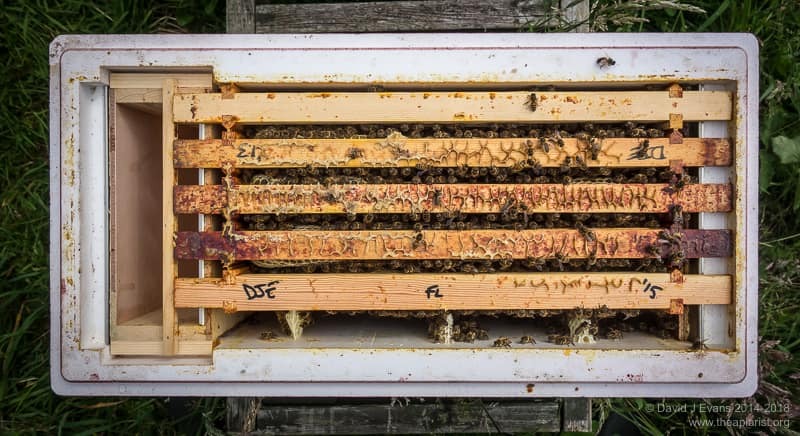 However, Layens developed the hive long before Varroa appeared on the scene, and monitoring and managing disease in a hive with no removable or open mesh floor – particularly with only a couple of inspections a season – seems an unlikely recipe for success to me 2. 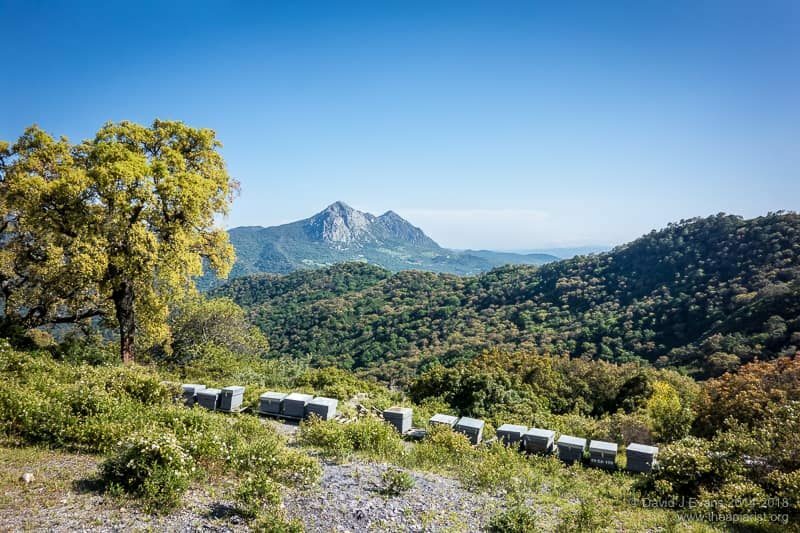 It’s reported that there are still more than a million Layens hives in use in Spain and the hive design has some strong supporters in the US 3. The hive design also lends itself to migratory beekeeping as there are no teetering stacks to be strapped together for transport. 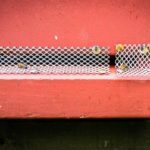 Spanish readers of this site represent less than 0.5% of the annual visitors … if you are one of them please add a comment on the practicalities of beekeeping using the Layens hive. I’ve visited this area of Andalucia for several years. 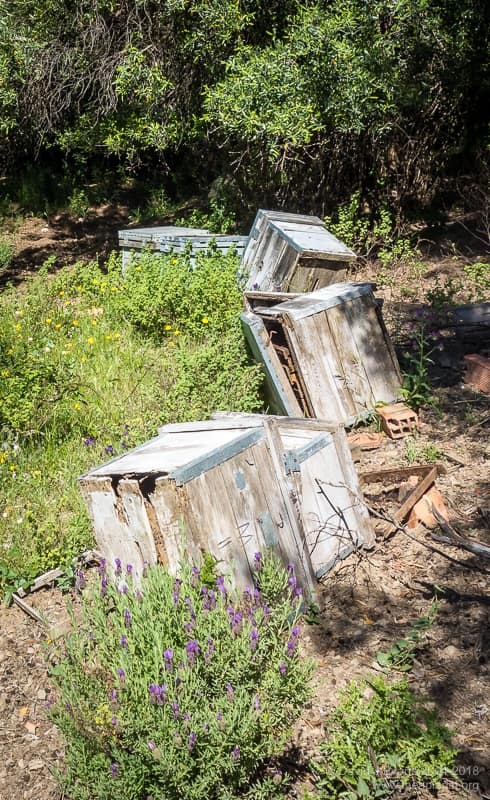 Near the village is an apiary that has – year by year – slowly been falling into disrepair. 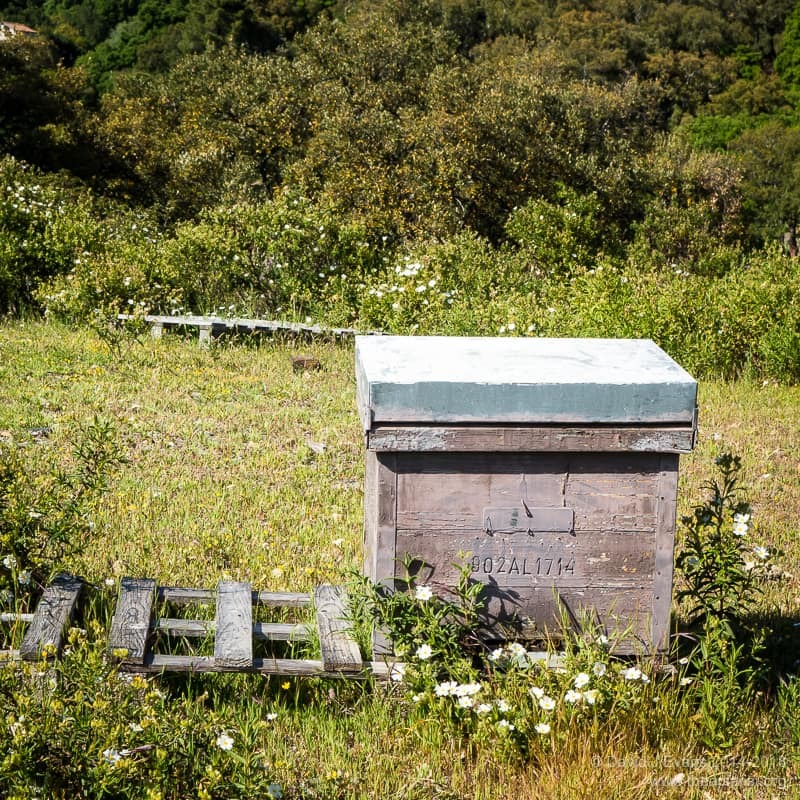 There were originally ~20 hives in lightly shaded woodland surrounded by wildflower meadows. It was a lovely spot, just off a little-used track, protected from the midday sun, secure yet accessible … though the view wasn’t a patch on the one at the top of the page. Five years ago most hives – all Layens again – were busy with bees and I remember being surprised by the number of hornets hawking around. The apiary carried a registration number and the hives were scruffy, but functional. Year by year the number of hives on their side, open, damaged or otherwise clearly defunct has gradually increased. Corners of the apiary filled with broken and discarded frames or other rubbish. By this Spring it was all over. There were still about 20 hives in the apiary, but none of them were upright and functional. The few that were upright were non-functional and the only one containing bees was badly damaged and on its side, with the bees gaining access from a split in the corner. 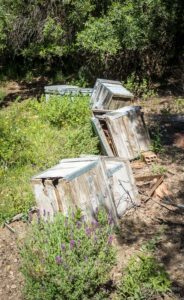 It appeared as though the apiary had been abandoned by just about everything other than the Jabalí … and they’d had a field day ransacking the hives. Of course, I don’t know the back story … an ageing beekeeper unable to cope any longer, hives inherited by someone without sufficient interest or beekeeping skills, or simply an unproductive apiary that was forgotten. 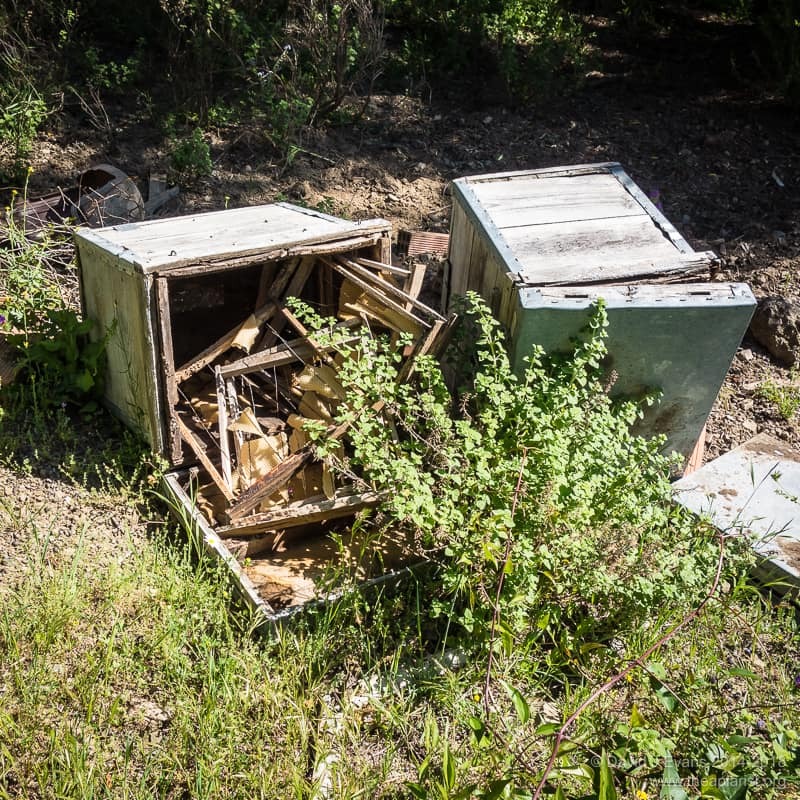 The hives were largely stripped out, but at one point must have posed a disease risk for neighbouring colonies. Unless mite levels were controlled the colonies would eventually succumb to Varroa-transmitted viruses. As the colony weakens it is likely to get robbed-out by strong colonies from nearby apiaries. The robbers returning to their colonies carry honey and hitchhiking phoretic mites. This is what the Americans call a “mite bomb”. There’s good evidence that this route of mite transmission peaks late in the season during a dearth of nectar. This is one of the reasons that justifies coordinated mite treatments at the correct time of the year to protect the winter bees. I have no imagination … I’ve used the “If Carlsberg did …” prefix a couple of times already, when discussing smokers and vaporisers. I’ll try and think of something a little more original for the future. In my defence I have spent 50% of the last four weeks abroad, successfully controlled swarming (by vertical splits or Pagdens’) in over half of the ~25 colonies I’m currently managing, run out of supers, brood boxes and frames (D’oh!) and been involved in some exciting new plans for going Varroa-free in the future. Watch this space. 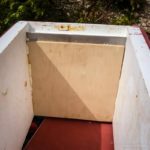 This entry was posted in Beekeeping, Drifting and robbing, Hives and nucs on June 8, 2018 by David. … make sure your stored broods and supers have it. For that matter, your hives need it as well. Early autumn is when wasps appear in droves. They gatecrash picnics and pester our bees as they search for carbohydrates. This year, after a pretty poor summer, they’re a bit later that usual … at least in this part of the UK. Queen wasps have now stopped rearing brood – which requires a protein-rich diet for the colony – and they’ve now switch to carb-bingeing. My apiaries are away from my house, so the first thing I become aware of is the increased numbers of wasps investigating the stacked up piles of broods and supers. ‘Wet’ supers containing residual honey after extraction are very attractive to the wasps. They look for any structural weakness in the stack … a poorly fitting roof, a warped crownboard or gaps at the joints in the boxes. 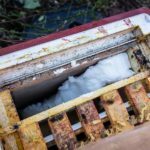 If any of these provide access there will be a never-ending stream of wasps making return trips from their nest site – which may be up to a mile away – and the source of the honey. When you walk past the boxes you can sometimes hear the rustling or scratching of the wasps as they look for additional routes out once they’re laden with honey. They can even chew through poly boxes where there’s a hint of structural weakness to gain entry or subsequent exit from the pile. In the picture (above) the corner of the upper Swienty poly super – at the point where the hive tool had slightly indented the relatively soft polystyrene – was mercilessly attacked, leading to a neat chewed hole large enough to give the wasps access. Maintain neat stacks of equipment, securely sealed at the base and the top. Try and avoid having an open mesh floor at the bottom of the stack, even if the entrance is sealed up. The scent of honey will still attract wasps from far and wide … and once they’re there they are very persistent. I use sheets of spare Correx or solid split boards with all the entrances closed up tightly on the bottom of the stack. If you don’t have anything suitable a sheet of thick polythene forms a reasonably impenetrable barrier – to scent and wasps. If there are gaps, and there probably will be as equipment ages and warps or gets bashed about, seal up the gaps as soon as you notice them. Waterproof gaffer tape is as good as anything for this as a temporary fix. It’s not only the integrity of empty stacks of equipment that is being tested at this time of the season. Wasps will show similar levels of interest in colonies of all sizes – from double-brood monsters bulging with bees to mini-nucs containing only a cupful of workers and a queen. Life’s a lot easier for the colony if they only have a single entrance to defend. Check the joints and junctions between boxes and seal any up where wasps might gain access. This includes the – entirely unnecessary in my view – ventilation holes in the roof. 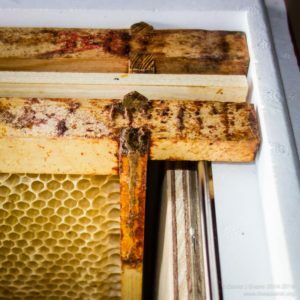 Unless these have well-fitted mesh there’s a chance the jaspers† can get in and from there to the honey supers if your crownboard also has another – entirely unnecessary – ventilation hole. Life’s easier still for the colony if the entrance is small and/or easy to defend. The kewl floors I favour, with an “L-shaped” entrance tunnel, provide ample opportunity for the guard bees to challenge any inquisitive wasps – at the entrance per se, or where the tunnel opens into the brood box. I don’t think I’ve ever had to provide additional protection to full-sized colonies using one of these floors. Small colonies, recently created colonies or colonies that are otherwise weakened are a different matter altogether. In all of these the colony is either understrength or lacking a full complement of worker types. 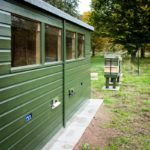 For example, newly created nucs containing a late-mated queen and a couple of frames of brood and adhering bees, may well not be up to defending themselves properly against the determined attention of wasps (which is the only sort of attention wasps are capable of). Mini-nucs or queenless colonies are particularly susceptible and regularly succumb to attacks by wasps. Maximise the opportunities these colonies have to defend themselves by restricting the entrance to a very narrow gap. The gaping maw of Thorne’s Everynucs definitely needs reduction, either by closing off 80% of it with grass stuffed into the gap (in an emergency) or using foam or Varroa mesh offcuts to achieve the same end. Slopping large quantities of sugar-rich syrup about the apiary is a sure-fire way to attract the striped hordes. Make sure feeders are watertight (syrup-tight) and don’t leak. Pour carefully and mop up any spills that do occur. I almost exclusively use fondant for late-season feeding. Spills are non-existent. The block is cut in half with a spade (or breadknife) and placed inverted on top of the colony. It takes seconds and works well. As an aside, you can feed fondant and treat with Apiguard at the same time – I’ve been asked about this recently. Don’t leave offcuts of brace comb lying about in the apiary. 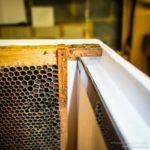 Tidy up after you, don’t conduct unnecessary inspections or leave unattended frames propped up against the hive stand while you slowly go though a colony. All of the above help the colonies avoid the attention of wasps … they also reduce the likelihood of colonies being robbed out by other bees, a topic I’ve mentioned before and will discuss in the future as it has very significant implications for disease transmission. † Jasper is a slang name for wasps I was aware of as a boy in North London. The origin of the term appears unknown, but QI has an interesting discussion on it. It’s variously ascribed to Dorset, Lincolnshire (East Midlands), Yorkshire and Glasgow. It’s also not clear the derivation of the word … ‘jasper’ sounds like the genus Vespa which our common wasps belong to. Alternatively, there’s a striped mineral called Jasper which (potentially, though not to me) resembles the striped abdomen of wasps. 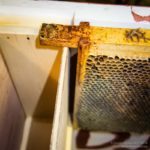 This entry was posted in Beekeeping, Hives and nucs on September 8, 2017 by David. The Everynuc poly nuc sold by Thorne’s is a clever design. However, the British National version is a bit of a compromise where beespace is considered and, as purchased, may not accommodate national frames properly. 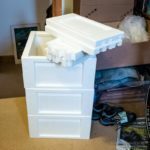 It can be improved relatively easily but requires a small amount of woodworking, some Gorilla glue and the confidence to take a saw to your recent £47 acquisition. The Everynuc 2 accommodates national frames in what is a Langstroth-sized box by having an internal feeder at one end of the box. 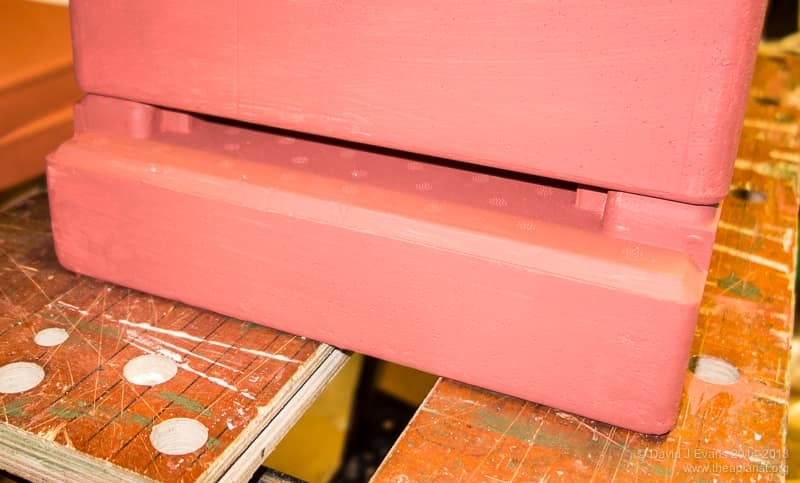 The frame rests on the upper edge of one side of the feeder and the opposite end of the box – presumably the entrance end of the nuc hive. 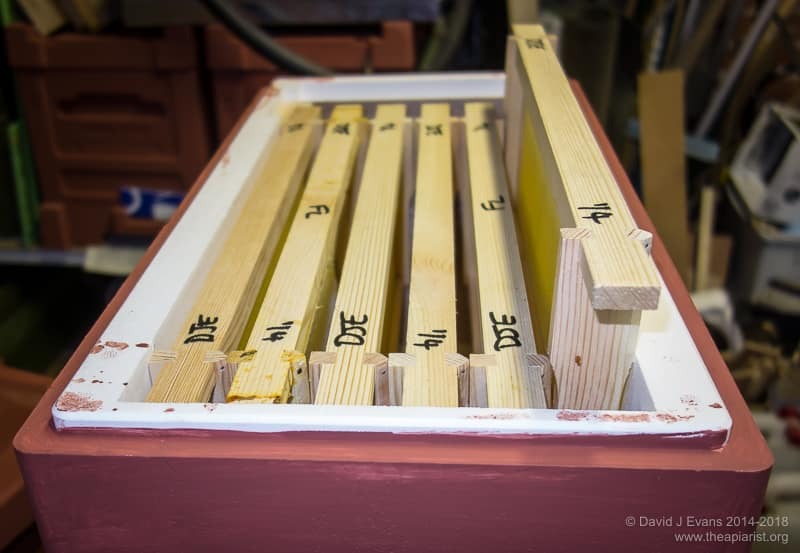 An 8mm thick piece of stripwood on the lower edge of the feeder stops the frame sliding ‘back’ (because the box is much longer than the top bar of a national frame), potentially crushing bees and certainly destroying beespace. 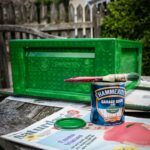 The box is supposed to be top beespace – it’s not really, particularly since the (Bayer manufactured!) plastic crownboard sags a bit. However, in those I currently own the feeder was too close to the crownboard, making it almost top beespace at one end of the frame and something much less at the feeder end (a more complete review and more photographs have been posted here previously). 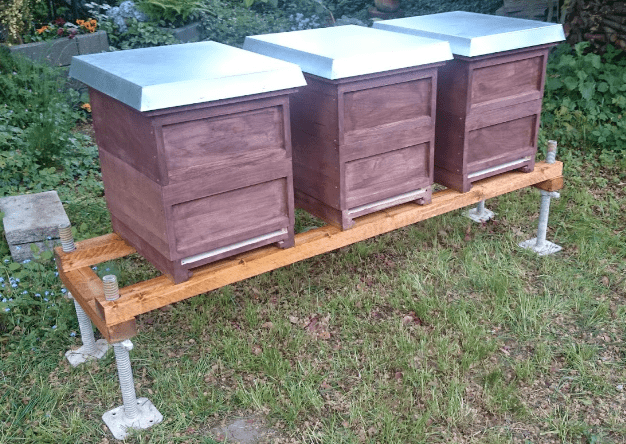 Furthermore, in the three boxes I painted this weekend the combination of incorrect top beespace and the thickness of the stripwood at the bottom of the feeder prevented the frame properly sitting on the frame rest at the opposite end of the box (see photo below right). The side supporting lugs for the feeder need to be reduced in depth by removing about 3mm from the bottom of them (the bit in contact with the sidewall of the nuc box). In the half-dozen boxes I’ve modified so far the lugs are all attached using glue and a nail gun. Belt and braces. In about half of them the nail hasn’t been driven in straight and the saw fouls it … simply remove the nail using strong pliers. Both sides need to be cut down by the same amount. 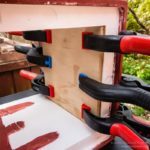 Add a frame runner to the inside of the feeder. 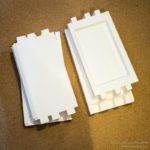 I’ve used plastic frame runners and stuck them in places using Gorilla glue. It needs to be just proud of the top of the wooden panel on the feeder (any higher and the bottom of the frame is raised above the wood spacer at the bottom of the feeder). 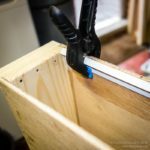 Clamp the runner in place and then trim away any glue that’s oozed out once everything has set. Add a cross bar of 9mm stripwood to act as a framestop, preventing the frames shifting ‘back’ as described above. It’s easy to add syrup or fondant directly into the feeder, but the crossbar removes any chance of the frame moving. These minor modification fix the top beespace problem and make the frames fit properly. The framestop makes transporting (e.g. by car or hivebarrow) these boxes much easier. 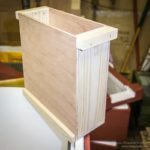 The reduction in depth of the supporting lugs doesn’t alter the 1-2mm that the bottom of a frame overlaps the 8mm stripwood on the bottom of the feeder (see the top picture). 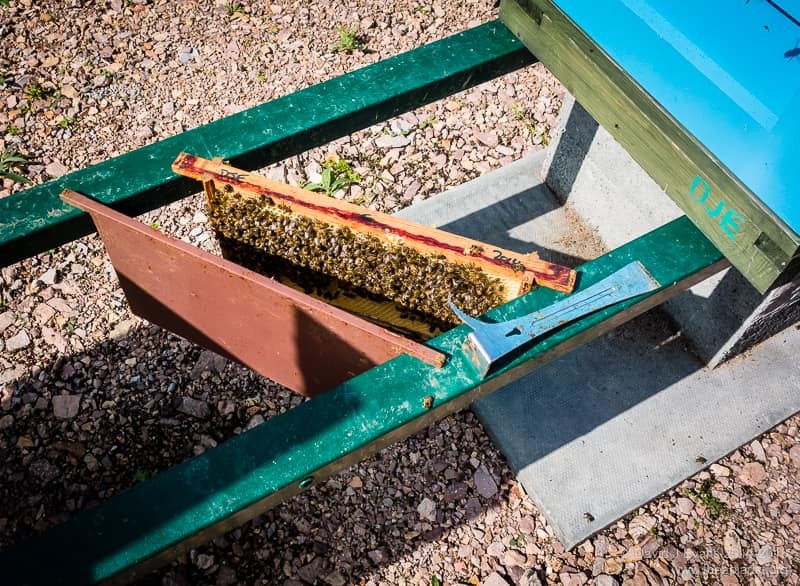 However, with top beespace, any slight bump lifts the frame clear of this stripwood and it can then slide back, crushing bees between the sidebar of the frame and the feeder. The addition of a framestop across the top of the feeder fixes this defect. Note – this post was written originally in March 2015 about Everynucs purchased and delivered in late 2014. I have subsequently purchased and received a further 18 Everynucs (received April 2015) which appear to have a slightly shallower ‘lug’ on the feeder. Those I’ve tested don’t appear to show the problem illustrated above, with the frame not seated on the runner. I can’t make a side-by-side comparison as I’ve already modified all of the original Everynucs I received. However, they all still have the wrong beespace at the non-feeder end, the solution for which is described below. The beespace at the non-feeder end of the nuc box is still wrong. 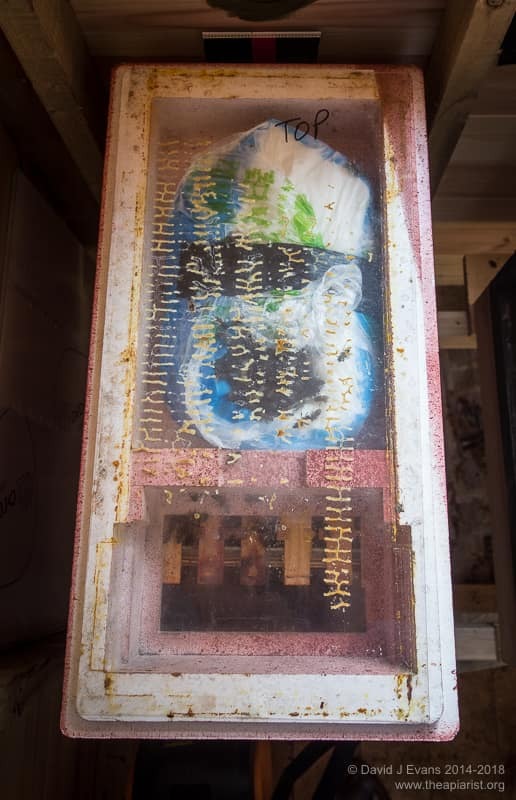 I overwintered a number of colonies in these nucs* and all had built brace comb between the frame end bars and the wall of the box, making frame removal messy and disruptive. 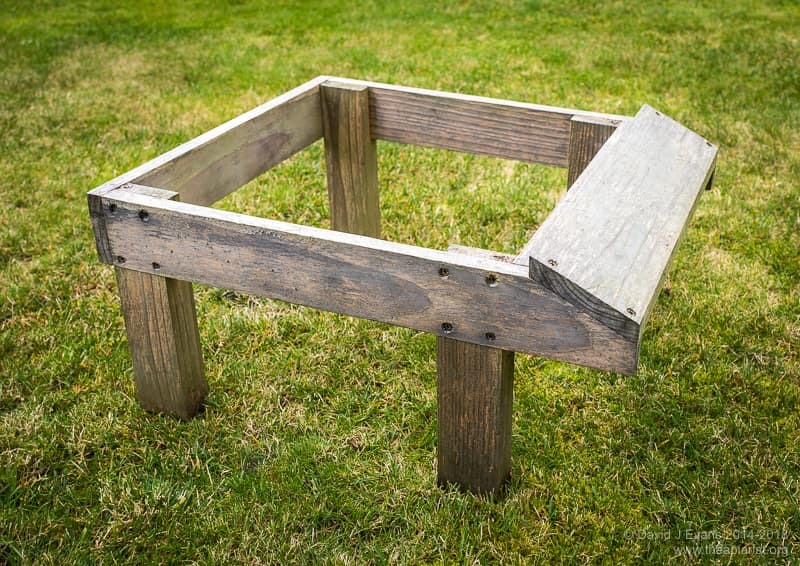 The incorrect beespace is due to the long lugs on a National frame being used in a box where the frame rests are designed for the short lugs on a Langstroth frame. To overcome this simply glue a piece of 8-9mm ply onto the end wall of the nuc. A piece of ply 20.4 x 20.5 cm (w x h) restores beespace. I’ve used Gorilla glue to hold it in place in the half-dozen modified recently. Since Gorilla glue doesn’t seem to form an irreversible joint with dense polystyrene I reckon I can take these apart if they are unsuitable (famous last words … and don’t trust me on this, test it yourself first). It seems a shame to have to modify what is probably one of the most expensive poly-nucs on the market. However, I remain reasonably certain that this is the best currently available. These boxes should last 20+ years if properly maintained and so justify a small amount of effort at the beginning to improve them. * I should add in closing that colonies overwintered extremely well in these nucs. Some were stronger coming out of the winter than full colonies that had gone in strong in September. I only fed with fondant, gently dropping slices into the feeder through the autumn. 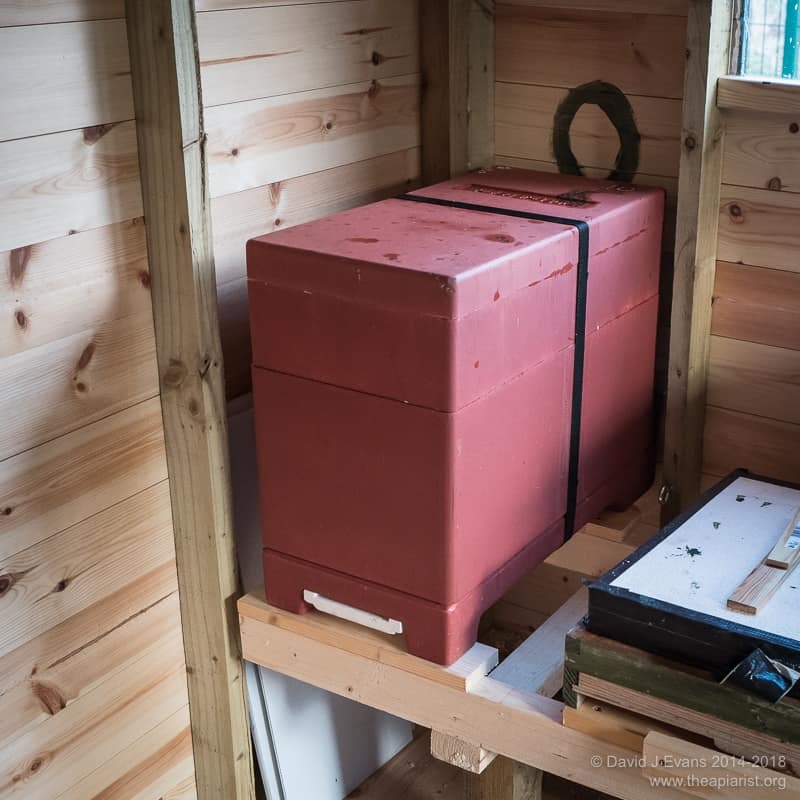 This entry was posted in Beekeeping, DIY, Hives and nucs and tagged DIY, Nucs, poly, Thorne's on September 26, 2015 by David.